I've been on a fall colors binge the last few days so I thought I'd try something with a bit more color. 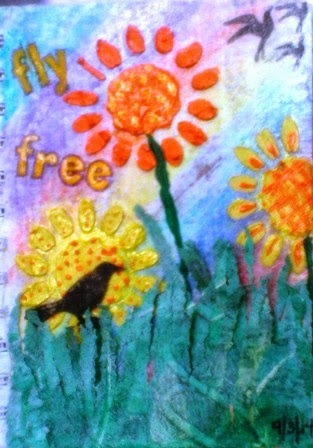 I started with a gessoed page and the use Liquitex Pigment Crayons that I bought several years ago. I have no clue how to use them so I did rainbow like stripes across the page. I thought a baby wipe would make them move and I'd blend them. Nope.. they didn't move. 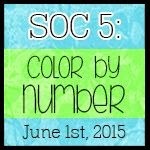 They were waxy like kids crayons with more pigment. I finally gave up and glue a white napkin over the whole page to tone down the color. Then I cut grass from a gelli print with my old deckle scissors. I love those scissors. The flowers are from a stencil my friend, Robin was giving away last year. I've used that stencil over and over. I have a lot of light purple molding paste/spackling compound left from another project so I used it for the flowers and let them dry over night. Today I painted the flowers with Artist Loft Glossy acrylic paint and then doodled a bit on them to make them whimsical. 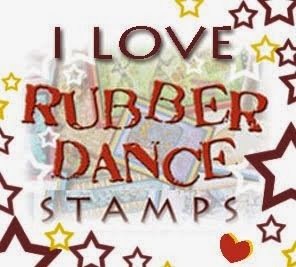 The birds and words are yet more stamps from my A Little Bird Rubber Dance stamp set. This set is huge. It has at least 20 stamps in it. My photos are not so great these days. I don't know if it's not enough light or the camera is sick. It could just be user error.